TravStar1 Point Of Sale SystemRegister Manual Gas TransactionsHow Do I Authorize a Dispenser? How Do I Authorize a Dispenser? 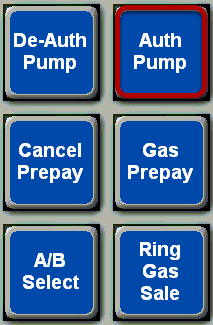 This lesson will teach you how to authorize gas pumps. Touch the icon for the dispenser you want to authorize. In this example, we will select dispenser number 4. After you touch the dispenser icon, you will see information about that dispenser displayed in the top left portion of the screen. Make sure that the dispenser status is Idle. You will see a message confirming that the dispenser is now Authorized. The customer can now dispense fuel. Prev: How Do I Check the Balance of a Gift Card? Next: How Do I De-Authorize a Dispenser?